University of Wyoming's on-campus store conveniently located in the Wyoming Union. Click here to see a map of the store. The University Store is more than just books! See what we offer! Located in the Student Union, The University Store is owned and operated by the University of Wyoming and is an official retailer of University of Wyoming apparel, including t-shirts, sweatshirts, hats and athletic apparel. When you buy University of Wyoming apparel, Wyoming gifts, or other merchandise from the University Store, the dollars you spend help support the University of Wyoming. We appreciate your efforts to keep the money within your institution. The goal of the University Store web site is to provide you with an enjoyable, hassle-free online shopping experience. We continuously monitor response to the site to make sure our customers are finding it friendly and easy to navigate. Whether you are a University of Wyoming alumni, student, Cowboy fan or Wyoming enthusiast, we hope you will find what you are looking for! We accept Visa, MasterCard, Discover, and American Express. 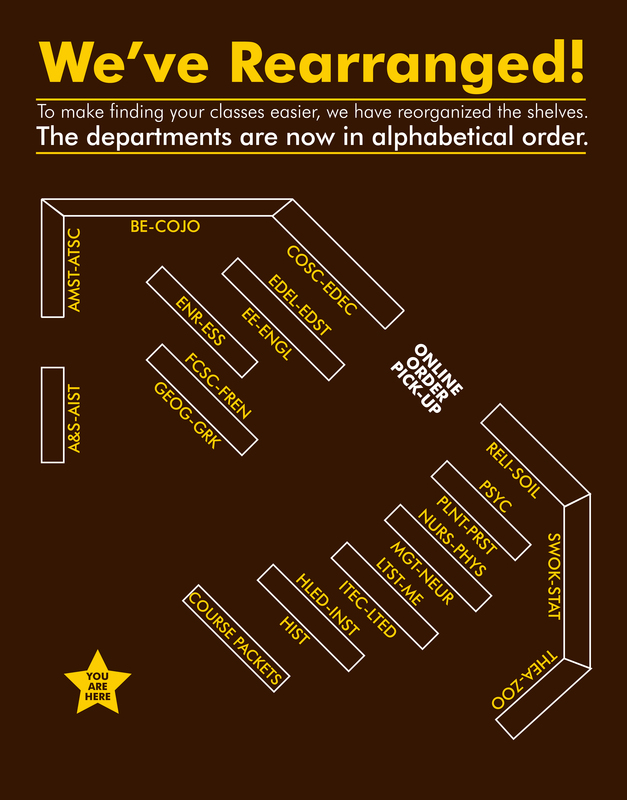 If you can't find what you are looking for, please call the Bookstore, (307) 766-3264. The University Store offers many services to students and faculty. The University Store offers a large selection of fine art products, including Windsor Newton oil and watercolor paints, canvases, easels, sketchbooks, and more! The Bookstore offers gift cards in any denomination that can be redeemd in store or online. To purchase a gift card call 1-800-370-2676 or come in to University Store. The Bookstore has a large selection of educationally priced computer software for University of Wyoming students and staff. We have PC and Macintosh compatible software as well as a variety of computer accessories including mice, MP3 players, USB drives and more. We also have many calculators, including scientific models. The University Store has a wide range of books including a selection of UW campus authors, children's books, Wyoming books, and New York Times Bestsellers which are 25% off everyday! The Textbooks Department has a complete selection of new and used textbooks for University of Wyoming classes on campus as well as Outreach classes. Buy your new or used textbooks online or visit the University Store! As an official retailer of University Wyoming clothing, we have a substantial selection of University of Wyoming apparel for Wyoming Cowboy fans. Come in and check out men and women's UW sweatshirts, T-shirts, hats and more! The University Store has official University of Wyoming merchandise and gifts perfect for UW alumni, fans, or Wyoming enthusiasts. The Clinique Counter is located just inside the University Store. Offering a full line of make-up and skin products, the Clinique Counter is your source for beauty and skin care! We offer departmental purchases and free delivery. Also, you can now ship UPS right from the IDR counter.